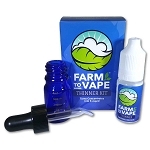 Farm to Vape was founded in Virginia in June 2014 by two long time heads that switched from smoking to vaporizing. We realized that people want the highest quality E liquid that can turn their herbal concentrates into an infused vape juice. We had tried blending PG/VG with wax using an expensive homogenizer only to have the mix separate minutes later and we didn’t want anything to do with nicotine & tobacco products anyway. We then turned to the lab where all of our research and trials led us to study the molecular weights of the active ingredients contained in herbal concentrates. Cannabidiol or CBD’s molecular weight is 314 for example. We then matched these molecular weights using our proprietary blend of medical grade polyethylene glycols PEG 300 & PEG 400 to perfectly mix our herbal concentrates every time. The idea of Farm to Vape was born.